With the variety of jeans on the market these days, figuring out how to wear your favorite denim at all hours and for any occasion is a snap. From classic styles such as skinny jeans to unique colors and designs, there's one style that often flies under the radar—gray jeans. For the moments when you don’t want to wear your classic blues, this neutral option—which comes in a broad spectrum of shades—will go seamlessly with whatever you wear. 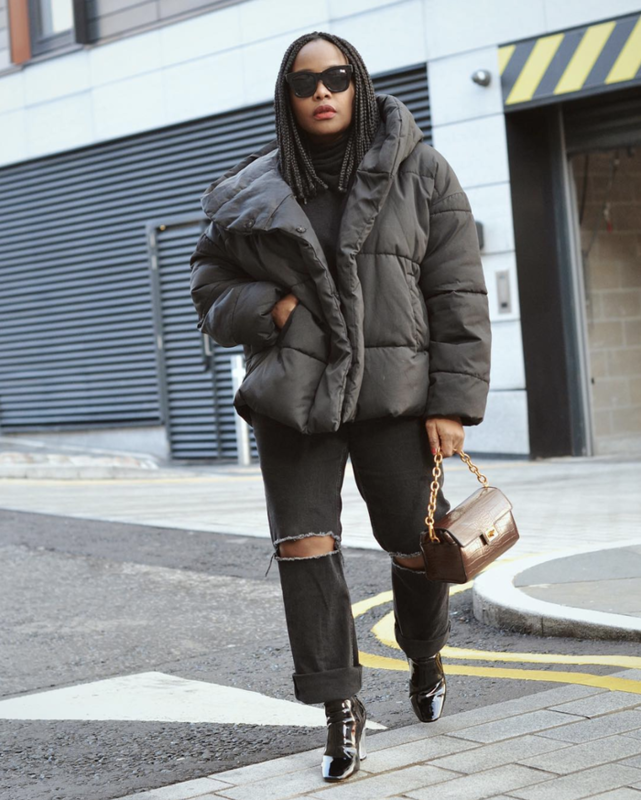 Style Tip: While it’s still cold out, opt for a monochromatic look with a pair of dark-wash gray jeans and a coordinated puffer coat. This will get you through the remainder of cold weather. Style Tip: A pair of kick-flare jeans with a raw hem will feel more polished with a sleek trench. Now this is a coat made for transitioning into spring. The fade on this pair makes them so versatile. Style Tip: One color that always pops with gray? Red. A red sweater will easily stand out among neutrals. You won’t get tired of wearing this sturdy pair of 100% cotton denim jeans. Style Tip: Trade in your denim blues with a pair of gray jeans for any casual ensemble. You’ll feel so cool wearing this throughout the spring season. A sleek pair of jeans that’ll feel like second skin. Style Tip: Wear an updated take on a classic blazer to give this classic outfit formula a modern update. We’ll never get tired of this editor-approved blazer from Balenciaga. Letting your ankles show is the first step in early spring dressing. Style Tip: Deep-hued gray jeans will feel perfect for your transitional outfits, like this one featuring an off-the-shoulder sweater. We’ll never get tired of this flirty silhouette. Swap out your standard blue jeans for this lighter gray pair. Style Tip: A heather-gray tee with a pair of faded gray jeans? Yes, please. A heather-gray tee is an essential staple. Wide-leg jeans always feel so polished. Style Tip: A striped button-down shirt with gray jeans is the essential ensemble for a casual Friday that'll take you from the office to happy hour. You can never go wrong with a striped button-down. This pair of jeans have an effortlessly chic touch to its wash. Style Tip: Cozy up in a cool gray sweater for an easy monochromatic outfit. Cozy up in this lightweight cashmere sweater. Slim boyfriend jeans will give you a relaxed, casual look to your ensemble. Style Tip: Camouflage is everywhere right, and it’ll look amazing with a pair of dark gray jeans. Add an edge of cool to your look with this jacket. These jeans have a loose fit that will give you a casual yet chic outfit in a minute. Style Tip: We’re loving the snake print trend that’s taken over lately, and with a pair of gray jeans, it looks extra edgy. We’re all about the snake print these days. Wear these dark gray jeans any season. Style Tip: Tuck your jeans into a pair of taller boots and wear them under a longline coat for a look that’s ready for spring showers. This coat, which has an elevated twist with the ribbon tie and the satin trim, will be one to wear for years. We can’t get over this cool wash. Style Tip: Want to let your bright boots stand out? Wear a pair of dark gray jeans and a black sweater for an easy contrast that makes an impact. This will be the perfect layering piece. These jeans are the perfect shade of gray. Up next, fresh new casual outfits you can wear with jeans.